Take a look at those two statements and we see both good and bad news. Good– Voters know that something is awry with current education policy and reforms, and as such, the public wants NYS to slow down and step back when it comes to Common Core Learning Standards. Bad– Voters have put their trust in the NYS Education Department (NYSED), which is supervised by the Board of Regents. To date, the Board of Regents (BOR) has done nothing to address the concerns brought forth by parents and educators. In fact, though Board of Regents Work Group released a list of recommendations in regards to Common Core Learning Standards earlier this month, the recommendations offered no meaningful solutions and continue to receive nothing but criticism from teachers, education experts, parents, advocacy groups and the state teachers’ union. You can read responses to the failed leadership of the Board of Regents here, or hop over to the Huffington Post where today Nicholas Tampio writes that “The Regents Aren’t Listening to Parents About the Common Core”. 3. It’s crucial voters contact their NYS Senators and Assemblymen today and advocate for change to the Board of Regents. 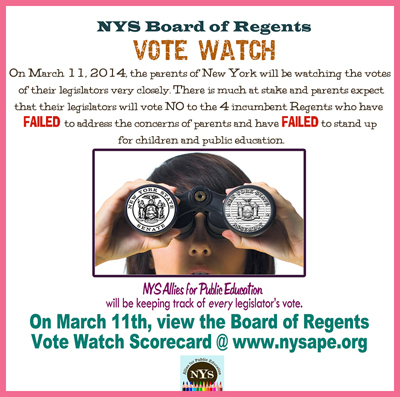 It is imperative voters join New York State Allies for Public Education in calling upon NY State legislators to vote NO for incumbents at the Board of Regents Election during the join legislative session to be held on Tuesday March 11, 2014. The public must let legislators know that voters expect they will be present at the vote, and that they will vote NO to the four incumbents. Otherwise, NYS voters are left with legitimate concerns sitting unaddressed by the sitting Board of Regents. It’s time for change. The Myth Behind Public School Failure: In the rush to privatize the country’s schools, corporations and politicians have decimated school budgets, replaced teaching with standardized testing, and placed the blame on teachers and students. Read more from Bakeman about the first meeting of Governor Cuomo’s panel here. This parent is looking forward to making the panel’s goal of increasing public support as difficult as possible. Then again, it’s not too difficult to convince parents and the general public that Common Core State Standards are not in the best interest of our children or schools. The panel put in place by Governor Cuomo to review the rollout of Common Core State Standards in New York met for the first time today. As we know, the Governor filled the panel with pro-Common Core supporters. A professor, and parent of children in the New york City Public Schools, Jeff Nichols, wrote a letter to Governor Cuomo’s panel in response to its invitation for public comment. Take a moment to read Jeff’s letter here. It gives an accurate and concise summary of why Common Core State Standards are not in our best interest and, in the author’s own words, provides a “simple” solution to the problem at hand: withdraw. Our allies at the Alliance for Quality Education held a rally this morning to demand that Utica City Schools receive it’s fair share of funding. Opt Out CNY was present to show our support for public schools. It was great to see Assemblyman Anthony Brindisi (D-Utica) present to advocate for fair funding as well as speak out against charter schools. Below, left, find links to media coverage from the event. 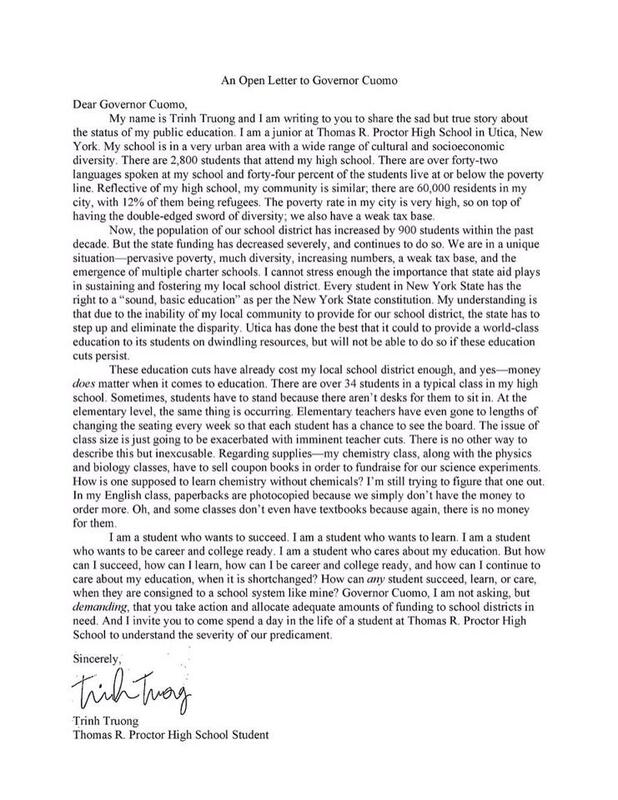 Below, right, a letter to Governor Cuomo from Trinh Truong, a junior at Proctor High School (click to enlarge). “With Governor Cuomo’s proposed education budget, Utica Schools will, yet again, be shortchanged. New York’s Constitution guarantees students to a “sound, basic” education, regardless of zip code, but during Governor Cuomo’s tenure the inequity between school districts has only grown. The Utica City School District is only able to spend $15,581 per student, whereas New York State’s average amount per student is $20,906. Utica needs more money to meet the needs of its diverse community. With the $1.9 billion increase to education funding legislators and advocates have been calling for, Utica would receive nearly $8 million dollars more than the current proposal. Four of the 16 member on the Board of Regents are up for reappointment this March and interviews for the positions were conducted earlier this month. New York State Allies for Public Education has endorsed four highly qualified candidates for the positions. You can read more about them, here. The current Regents, James Cottrell, Christine Cea, James Jackson, and Wade Norwood, have been dismissive of parents’ concerns and have shown very little (nearly no) criticism of Commissioner King or Chancellor Tisch. Maybe, then, we should not be surprised that during her interview, Regent Cea gave vague responses to questions regarding special education, despite her claim that she is the “voice of disabilities”. Not only were her answers vague, but the answers clearly show that Regent Cea lacks the basic understanding of how an IEP is written and how the Common Core Learning Standards are impacting students with disabilities.